A CHART MAP OF GEORGIA. 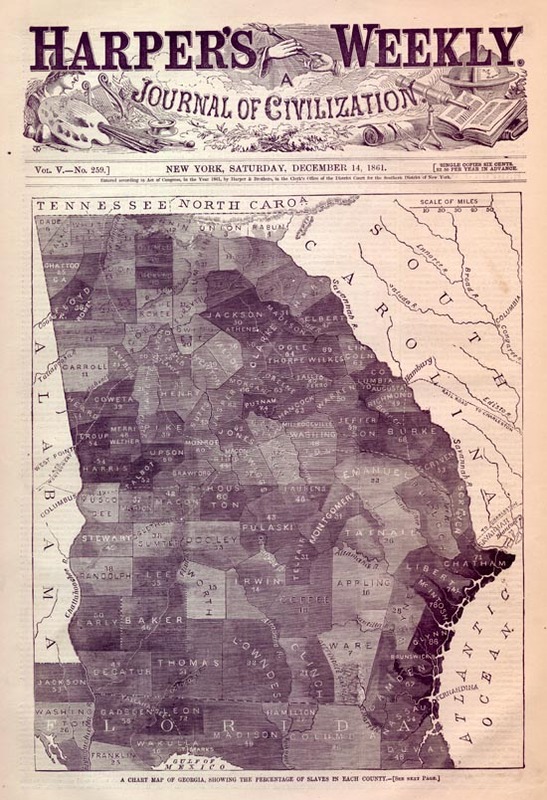 WE publish on the preceding page a CHART MAP OF GEORGIA, similar to the one we published of South Carolina in our Number of November 23. The tint, by its depth of shade, shows the comparative percentage of slaves to the total population in each county, that percentage being likewise stated in figures in the centre of the tint. Thus in Ware County only seven per cent of the total population are slaves, while in Chatham County the percentage is 71, or nearly three-quarters. It will be noticed that the largest slave communities are on the seashore and round the points to be occupied by our troops. Chatham County, in which Tybee is situate, contains 71 per cent. of slaves ; Glynn County, where Brunswick is situate, 86 per cent. ; Camden County, whose sea-port is Fernandina, Florida, 67 per cent. This map will be of use to the philosopher and student.